After the last post about CVI, I received a submission of an article of another sort related to visual processing and therapeutic riding. This is a piece that Brittany Halstead of ReplayPolo wrote for PATH Intl.’s quarterly magazine STRIDES to be published in the spring, so you get a sneak peek! 🙂 She hopes it will give us a hint about how our visual processing system in our brain plays a role with our eyes, which then correlates to our everyday life functioning. I’m so happy to have a contributor, and excited to share this with you. Thank you, Brittany! For over 10 years as a PATH Intl. Certified Registered Instructor I had been teaching therapeutic horsemanship to people with disabilities. I was also a professional showjumper, who, in 2014, traveled to Argentina to ride showjumpers and to connect with the polo community. 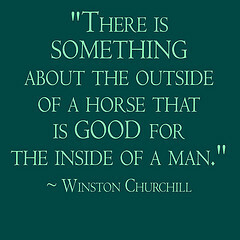 I founded ReplayPolo 501c3 Organization to save retired polo ponies where they could pay it forward as therapy horses. My dream was to start a therapeutic riding program for people with disabilities, including brain injuries in the US. Little did I know I would shortly become a person with a disability who struggled to return to riding and coincidently a retired polo pony was my helper to getting my life back on track. My last memory is being at an amazing party at a polo farm in Argentina and my next was six weeks later waking up in Nashville, TN, seeing friends and family. After a head-on car accident, I had been taken to a local hospital with a fractured skull and placed in a medically-induced coma. When I returned to the US for rehabilitation from a traumatic brain injury (TBI), I had to literally relearn how to do everything–feed myself, brush my teeth and walk again. 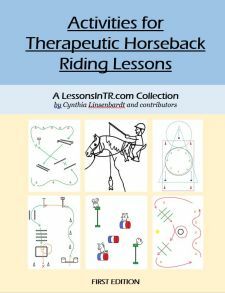 While I began to recover much of my pre-injury functioning, my vision, which 2 and a half years later, I would later learn had a great impact on my balance and motor skills required for riding, was not recovering as well as my other abilities. Very few health care professionals, including head trauma rehabilitation centers, are adequately aware of visual processing problems resulting from a traumatic brain injury. I was referred to neuro optometric rehabilitation and vision therapy after a neuropsychologist recommended I enroll in Coastline Community College Acquired Brain Injury Program. The program is a demanding one-year educational program designed to provide structured cognitive retraining for adults who have sustained a brain injury due to traumatic (such as a motor vehicle accident or fall) injuries or non-traumatic (such as a non-age-related stroke, brain tumor or infection) causes. Everyone processes visual information from the eyes and body to the brain in a sophisticated way while riding a horse; this processing also links the eyes with physical balance so riders can flow with the horse and become one. The rider’s midline matches the horse’s midline. If the visual system is inefficient, every task can seem difficult. In my case, the rehabilitation center diagnosed me with visual midline shift syndrome. My symptoms included: dizziness, nausea and spatial disorientation. I consistently stayed to one side of hallway or room when walking and bumped into objects. When I would walk through doorways I would always grab on the sides to reassure I would walk through the middle. I also had poor balance and posture. I leaned back on my heels, forward or to one side when walking, standing or seated. Post vision syndrome is another common TBI issue, whose symptoms include dizziness and nausea, as well as double blurry vision, headaches, pulling away when objects are brought close and staring behavior. Other symptoms include attention/concentration difficulties, spatial disorientation, reading comprehension problems, losing one’s place while reading and visual memory problems. During the initial treatment of the concussion or traumatic brain injury, visual processing problems are usually overlooked, which lengthens and impairs rehabilitation. The Neuro Optometric Rehabilitation Association (N.O.R.A) states, “More than just sight is measured in terms of visual acuity, vision is the process of deriving meaning from what is seen. It is a complex, learned and developed set of functions that involve a multitude of skills. Research estimates that 80 to 85 percent of our perception, learning, cognition and other activities are mediated through vision. For riders, visual difficulty negatively impacts their center of gravity and makes it hard to connect with the horse’s center of gravity. Focusing on the task, for instance, stopping at letter D, picking up a toy on the barrel or weaving cones, tires the brain as it processes information from our eyes. This often leads to neuro-fatigue in riders that have neurological impairments. According to Dr. William Padula, the visual process is bi-modal. This means there are two separate yet coordinated processes involved. The first system (the focal system) isolates detail and delivers attention, consciousness and presence in the moment. The second process (the spatial or ambient visual process) organizes people’s posture and body orientation to keep them upright against the force of gravity. The spatial visual process is what allows people to anticipate changes in what they see as they move and perform tasks and make adjustments in posture to accommodate those changes. When this system is damaged, it leaves the first process (focal) to focus on detail intact, but without an ability to anticipate and respond to changes, it leaves us “stuck in the moment.” This dysfunction can produce significant fatigue and sometimes precipitate headaches or migraines. The implications of this type of dysfunction for riding are numerous. If the rider has a compromised ability to anticipate changes in posture necessary to balance, it becomes much harder to coordinate with their horse. The rider has an extra challenge to achieving correct equitation, balance and timing with their aids. The special yoked prism glasses that I was prescribed enhanced my eye-brain communication and strengthened its functioning so I could ride again. But before these glasses could be prescribed I had to undergo a neuro-visual rehabilitation evaluation, which is very different from a routine eye exam. According to the institute, its purpose is to analyze in depth the relationship between the ambient visual process and the neuro-motor system using a variety of tests. After a comprehensive evaluation is made, prescriptions can be given for various types of lenses and glasses that can stabilize a person’s sense of space, ambient and focal processing. Frequently, the doctor will prescribe specially designed “yoked-prism” glasses that shift the concept of visual midline affecting balance and posture. When I first started riding again, even a sitting trot was complicated. It was ridged and bouncy which my head would feel this pounding matter. When I would transition down to a walk, sometimes I would get a feeling I was in outer space and not riding a horse. In order to perform a proper sitting trot, a rider’s center of gravity must match the horse’s center of gravity to create a smooth relaxed seat, but my spatial visual system would easily become fatigued when presented with too many changes. When I would first move into sitting trot, it would feel so smooth and easy. But if I then started to canter and go over some poles and back to a sitting trot—it would become rigid and bouncy. That’s because my visual system would become easily fatigued and I would then find it difficult to synchronize my center of gravity with the horse’s center of gravity. Since I couldn’t even master the sitting trot at first, I was scared to jump. Maintaining my center of gravity with the horse over a fence would happen so quickly, I would often be left way behind. But, thanks to my very first ReplayPolo pony (a retired polo pony) named Fanta, I was able to begin jumping again after my TBI. There is something about polo ponies–they know how to catch the rider’s balance. At the approach of a jump, Fanta would even flick one ear back at me, which I would take as a signal for me to two-point and stay with her. She never left me behind. It was only Fanta and I in the ring. Due to her training and natural ability as a former polo pony, I was able to trust her to keep me balanced. In a polo game, for instance, these polo ponies are constantly shifting their balance to catch and maintain their rider’s seat awhile responding to a million things happening during a match. My eyes are now fluidly communicating; my balance and visual processing are stable. Thanks to Fanta, my Replay Polo pony I was able to hold onto my passion and restart my career as a professional equestrian. It’s ironic how for so many years, my polo ponies have been my partners in helping my riders with special needs heal and now they are the ones helping me on my healing journey. This whole experience has definitely given me a new perspective about life. I am now a person with a disability. I am a person that still loves horses, and just like my students I have taught as a therapeutic riding instructor, I am using horses to heal. Brittany Halstead is a PATH (Professional Association of Therapeutic Horsemanship) Intl. Certified Registered Instructor and Mentor. She is executive director of ReplayPolo, a 501c3 charity organization that saves polo ponies and transforms people’s lives through these amazing creatures. If you would like to adopt or donate a ReplayPolo pony, please visit www.replaypolo.com or email Brittany at replaypolo@gmail.com. Fixation: Quickly and accurately locating and inspecting a series of stationary objects. Eye Tracking: The ability of the eye to move smoothly while following a moving object. Focus Change (Accommodation): Looking quickly from far to near and back without blur. Depth perception: Judging relative distances of objects – how far or near they are. Peripheral vision: Monitoring and interpreting peripherally what is happening in the surrounding field of vision. Binocularity (Two Eye Vision) and Eye Teaming: Using both eyes together as a team smoothly, equally and accurately, which supports depth perception. Maintaining attention: Keeping focused on a particular activity while interference, such as noise or motion, is present. Visualization: Accurately picturing images in the “mind’s eye,” retaining them and storing them for future recall. Near vision acuity: Clearly, seeing, inspecting, identifying and understanding objects viewed within arm’s length. Distance acuity: Clearly seeing, inspecting, identifying and understanding objects viewed at a distance. Thank you again for sharing your story, Brittany!